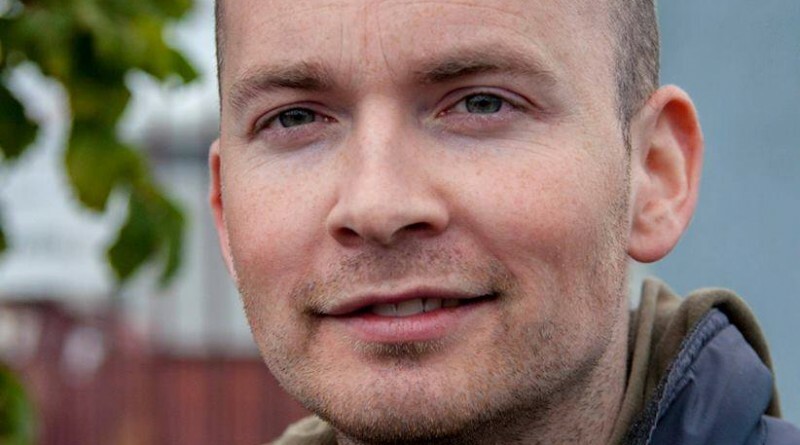 PAUL Murphy is an interesting figure – a polite, well-educated 33-year-old from a middle-class background – who speaks in rapid fire about his passion that the poorer people rise up and challenge austerity and “the establishment” in the forthcoming General Election. In this, the first part of a series of interviews with the Anti Austerity Alliance TD, we get to grips with Murphy’s persona and his quest for a Left Government. The left politician genuinely believes this election will be different – that the working class vote will increase and that austerity can decrease with it. This is the first time I have met Murphy – whom had become a real figure of interest as he awaits a criminal trial for alleged involvement in the false imprisonment of Tanaiste Joan Burton during a water charges protest in Jobstown, Co Dublin in November 2014. When we meet Murphy in a cafe bar in Dublin, the legal proceedings are a matter that must stay off the table to allow for a fair trial for the TD and the 17 others who will appear before a judge and jury for the alleged charges. Meeting Murphy for the first time, after seeing him only on TV is an intriguing experience. When compared to certain political leaders of Fine Gael, Fianna Fail, and Labour, the cardigan-wearing Murphy, may not exude the empowering political and corporate approach of the mainstream politician – but in what he lacks in the suit department, he makes up for in genuine old school passion. “I’m looking forward to the elections,” Murphy said. “I think it will be good to get out there and talk to people. There’s a big opportunity there to make a change. If you look at what happened in Spain, the same thing could happen here in Ireland. We could also achieve a bit more of a stabilisation in the establishment. The two party system has been broken. In December Spain’s political parties faced a struggle to gather a stable government after a historic election that tore asunder the traditional two-party dominance. For decades the conservative Popular Party (PP), now led by PM Mariano Rajoy, and the Socialists (PSOE) had dominated the Spanish political landscape. But a climb in support for the anti-austerity Podemos party and the centrist Ciudadanos broke the mould. Murphy believes that while the Left do not have enough numbers to storm a victory in the General Election – they are increasingly becoming a fly in the ointment of the “establishment,” and that poorer voters are being underestimated. This election is different to any other that has come before in Ireland, Murphy said. The former UCD law student says as he sips his coffee in this city centre cafe-bar, full of jeans-wearing student types. “A huge number of working class people have become politicised. Communities have been active over water charges and marriage equality. “A huge number have been registered to vote for the first time. A large amount of commentators aren’t taking that in to account. 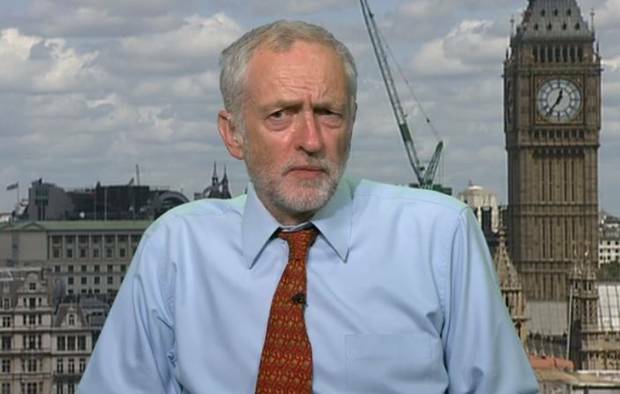 “That’s hopefully going to see a good performance from the Left to strengthen the movement against austerity. The voting predictions aren’t necessarily going to be accurate because we believe more working class people will vote this time. For those who have been affected by austerity – Murphy believes – with the latest figures showing 120,700 men are unemployed and 71,000 women out of work in Ireland – and 92,291 mortgages in arrears – 33,000 of these, family homes in arrears for more than two years – ad 17,000 legal proceedings on these before the courts – the Left is becoming more appealing. 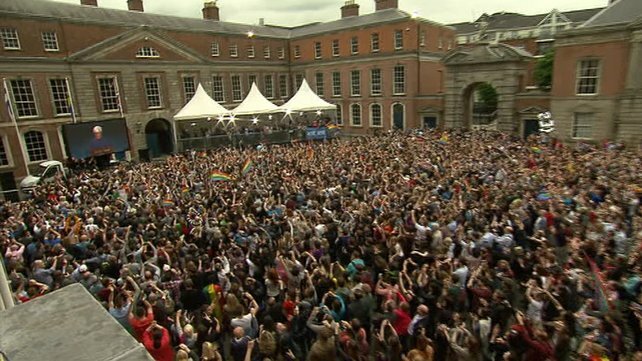 Power of the people: The Marriage Referendum has politicised people. But as most people switch on their TVs, radios, and open their newspapers or log on to mainstream news websites, the main parties still being written about are Fine Gael, Labour, Fianna Fail and to a lesser extent Sinn Fein. 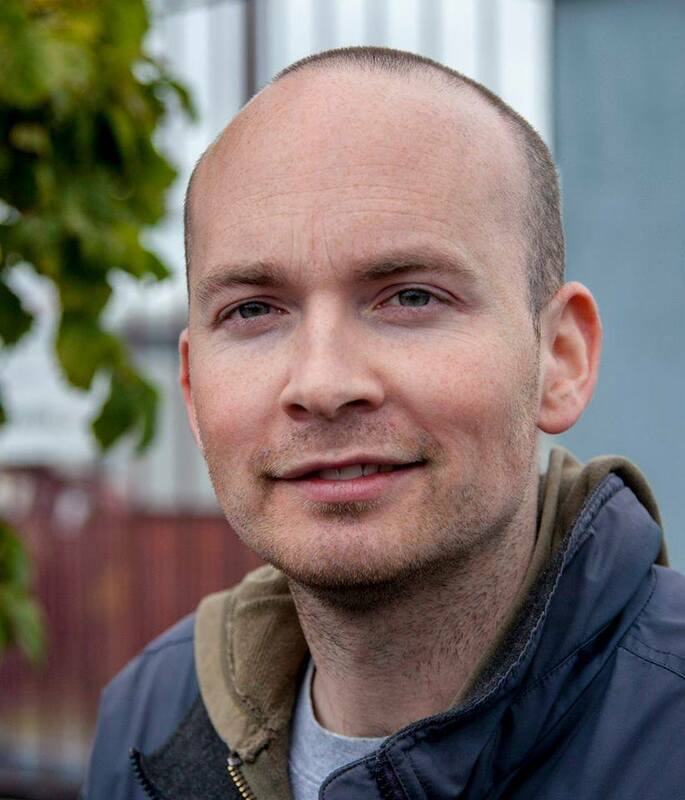 Though he feels the Left is winning the fight among poorer and struggling people – and with social media a powerful tool in his artillery – Murphy has 11,500 followers on Twitter and 21,261 on Facebook – he does not have the same power getting his message out in the mainstream media. 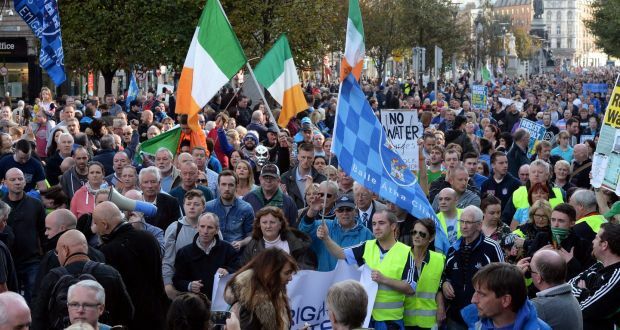 But with daily Facebook and Twitter updates on water charges, abortion rights, and austerity issues across the board, it is yet to be seen if the political battle between social media and TV/radio/mainstream news will win to increase the Left’s position. Murphy believes that the message has already been filtered out – and if his following is anything to go by, only time will tell. Yesterday Murphy emailed his huge Facebook base of fans – telling them to stand strong on their water charges boycott. “I’m hearing lots of stories of Irish Water sending text messages, letters and making phone calls to who they call their ‘customers’. The TD then used Facebook to state that “there are no penalties for non-payment until July 2016 – after the general election. “Event then the penalties are relatively small – €30 or €60. “Unlike with the property tax, they cannot take water charges from your wages, social welfare or pension. “They could only start a process to try to take it off people at the end of 2017 and it would involve two court cases. He then went on to invite people to help build attendance at January 23 protests to help give confidence to people to stick with the boycott and use the election to put pressure on all the parties on water charges. But for Murphy – though he feels he and the Left, may be winning the fight for the working class vote in many areas, the TD is pragmatic and he feels the war is far from won across the board. “If we get 4 per cent of the vote this time, then you’re talking about years rather than decades before the Left could get in Government, but there is no guarantee . It is not likely to happen this time, but of course we want to be part of a Left government this General Election. I do feel we are talking about years rather than decades for our position to be strengthened though. And if we look at how things have changed across Europe, things can happen quickly. “It’s about rewriting the political landscape. If you look at Syriza, in 2009 they had made major mistakes. Murphy’s voice reaches a crescendo as he places his coffee gently down, his eyebrows raised in anticipation. “The previous models of who will vote aren’t necessarily accurate anymore,” he said. His voice returns back to rapid fire. It seems that no matter how fast this man talks, he is throughout switched on, not pausing for thought because apparently these issues are either so close to his heart – or he has rehearsed them very well. Notably, Murphy seems to talk off the cuff in a more lucid and challenging manner than many politicians witnessed centre stage. He continues, failing to take a breath: “For example Tallaght, my constituency, has really low levels of voting. “One area called Brookfield, there were only 18 per cent of people who voted in the by-election, which is a really low figure. You won’t see the same level of voting there as the very well off areas, where people are more likely to vote, but I think that because people have been politically involved in a mass movement against water charges and marriage equality, that this movement is bigger than the establishment want to take in to account. A group of Enda Kenny’s team, including Mark Kennelly, chief of staff, Tom Curran, Fine Gael general secretary and Mark Mortell, a key political adviser to the Taoiseach, spent two days in London with senior British Conservative Party representatives in the wake of the shock July General Election victory for David Cameron. Like the Tories, Fine Gael is centring its political battle for dominance on the long-term economic plan. And though unemployment figures remain high – a key factor in the Fine Gael campaign to prove their economic prowess – the Left is questioning what type of jobs are actually available to people, with concern that the conditions workers are in are less than desirable. Recruitment agency, Glassdoor has found that the number working part-time has increased substantially since 2008. In Ireland, just under one in ten work as so-called “involuntary part-time workers.” – the third highest number in a study of 16 EU countries. While Ireland is one of the toughest countries in the EU to actually secure a job – the recruitment company found it the 12th hardest country to find work – out of 16 countries. Estonia, Norway, Austria, and the UK were found to offer the best prospects for a job seeker – therefore it might be more understandable why the Tories could use jobs figures and the economy so readily to succeed in gaining victory. For Murphy, the fight up to the election is about beating the spin and drawing the battle lines to continue a campaign against austerity – which Murphy feels is very much still a matter of national importance given the high numbers in long-term debt, the high unemployment figures and massive homelessness statistics. We, the Left, do have a voice. If Corbyn’s voice got out against the odds, and our voice gets out, against austerity, which I think it will, the political shape will change. If Corbyn’s voice can get out: The Left’s voice in Ireland can get out, says Murphy. “That the left could be involved in a Government in the next election is not the most likely outcome but what’s clear is like with Spain, this will be another step in defining the election landscape. “This will be the third election since the financial crisis – In 2011 you had the smashing of Fianna Fail, a traditional mainstream establishment party. “The link was broken with the working class there. Then in 2014 it was the smashing of Labour in Ireland, when they gained less that 5 per cent in the European Elections and this year I think you’ll see that combined, with Sinn Fein, which has a clear austerity mandate, you’ll see the emergence of the Left.